Paul Bennett played high school football in Scarbough, Ontario and later played university football with the Wilfrid Laurier Golden Hawks under hall of fame coach, Dave ‘Tuffy’ Knight. Bennett began his career in 1977 as a protected draft choice of the Toronto Argonauts. In his rookie season he was a starter at Defensive Back and was awarded both All-Eastern and All-Canadian honours. He also set a new CFL record in 1977 gaining 965 yards in punt returns. In July of 1980, Bennett was traded to the Winnipeg Blue Bombers, where he played for four seasons. Bennett played his remaining years with the Hamilton Tiger-Cats, and had an outstanding year in 1985, winning All-Star accolades along with the James P. McCaffery trophy and the Schenley for being the Most Outstanding Canadian. 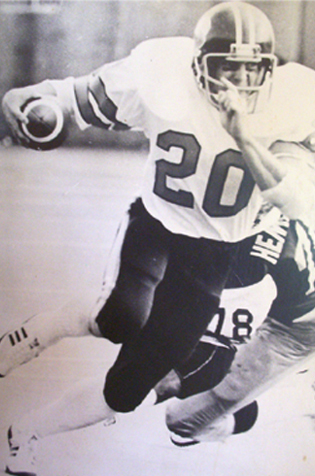 At the time of his retirement in 1987, Bennett held CFL records with 659 punt returns for 6,358 yards and a total of 1,004 yards of interception returns.